Peer Instruction: What does the research say? Methods and Materials » Peer Instruction » What does the research say? The development of Peer Instruction was motivated by Halloun and Hestenes 1985, who developed the Force Concept Inventory (FCI) (Hestenes, Wells, and Swackhamer 1992), a test of students’ conceptual understanding of forces. This research showed that after traditional lecture instruction, students’ understanding of the most basic concepts of forces is very poor, but that using PER-based teaching methods can significantly improve this understanding. Many of the questions used as ConcepTests in Peer Instruction are also based on the research literature identifying specific student difficulties with physics concepts (for an overview, see McDermott and Redish 1999). ConcepTests are often designed to elicit these difficulties, with the wording of multiple-choice options based on actual student responses to open-ended questions reported in the research literature. Peer Instruction is one of the most widely adopted and most commonly modified of any PER-based teaching method (Henderson and Dancy 2009). A great deal of research has been done on the implementation and adaptation of Peer Instruction in different environments. Fagen, Crouch, and Mazur 2002 surveyed 384 PI users and collected FCI scores from instructors of 30 courses at 11 colleges and universities, and found an average gain of 39%. This average gain is less than that found at Harvard, but still within the “medium-g” range typical of classes using PER-based teaching methods, and higher than that found in classes using traditional lecture methods (Hake 1998). Turpen and Finkelstein 2009 conducted qualitative research using classroom observations and interviews to characterize the different ways that instructors implement Peer Instruction, and have found that practices vary widely and that different practices establish different classroom norms. Henderson and Dancy 2009 interviewed instructors using Peer Instruction and found that most instructors made significant modifications to the method. One frequently asked question about Peer Instruction is which of the specific elements outlined by Mazur are critical to success, and which may be adapted without negative consequences. For example, is it necessary for students to answer each question twice, first individually and then after peer discussion? Lasry, Charles, Whittaker, and Lautman 2009 studied the importance of peer discussion by assigning students to participate in one of three variations on Peer Instruction. Each group answered a series of questions twice. For each question, they answered it first after thinking individually, and then after some time. In between responses, one group discussed the question with peers, a second group reflected quietly, and a third group looked at an unrelated sequence of cartoons. Lasry et al. found that students who engaged in peer discussion performed significantly better on the questions the second time than the students in the other two groups. These results suggest that it is the peer discussion, rather than simply having extra time to think about the question, that leads to the increase in correct answers. Another common concern is whether the increase in correct answers after peer discussion is due to learning through discussion, or due to the students who know the answer giving it to the students who don't. Smith, Wood, Adams, Wieman, Knight, Guild, and Su 2009 studied this concern by asking students a pair of isomorphic clicker questions. They found that after discussion of the first question, there was a significant increase in the number of students answering the second question correctly individually, suggesting that students had learned something from the peer discussion of the first question that they could apply to the second question. This was true even among students who answered the first question wrong both times. A more controversial question is whether it is necessary for students to answer questions individually first, or if Peer Instruction works just as well if this step is skipped. See this post on the Peer Instruction blog and the comments on the post for a discussion of this question. While no studies have directly addressed the question, the results of Singh 2005 suggest that answering individually first may not be critical. Singh asked two groups of students to answer questions on the Conceptual Survey of Electricity and Magnetism (CSEM). One group answered the questions individually first, then worked in pairs and answered the same questions again (similar to Peer Instruction), and the other group answered the questions in pairs first and then individually. For the first group, as expected, their scores increased significantly after they worked in pairs. However, the second group performed just as well after working in pairs with no time to think through the questions individually first (and the extra time working on their own afterwards did not significantly change their scores). These results demonstrate that students can perform just as well on group activities if the individual answer step is skipped. However, this study did not test whether they were able to apply this learning in any other context. S. Chasteen and S. Pollock, Tapping into Juniors’ Understanding of E&M: The Colorado Upper-Division Electrostatics (CUE) Diagnostic, presented at the Physics Education Research Conference 2009, Ann Arbor, Michigan, 2009. I. Halloun and D. Hestenes, The initial knowledge state of the college physics students, Am. J. Phys. 53 (11), 1043 (1985). C. Henderson and M. Dancy, Impact of physics education research on the teaching of introductory quantitative physics in the United States, Phys. Rev. ST Phys. Educ. Res. 5 (2), 020107 (2009). D. Hestenes, M. Wells, and G. Swackhamer, Force concept inventory, Phys. Teach. 30 (3), 141 (1992). 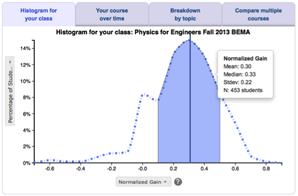 L. McDermott and E. Redish, Resource Letter: PER-1: Physics Education Research, Am. J. Phys. 67 (9), 755 (1999). C. Singh, Impact of peer interaction on conceptual test performance , Am. J. Phys. 73 (5), 446 (2005).